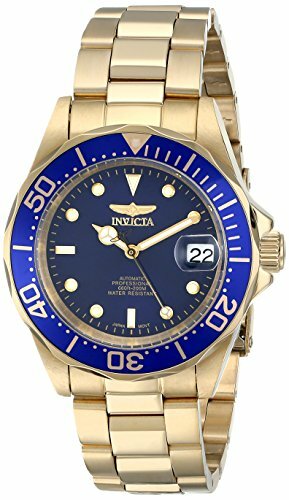 With the affordable gold-tone Invicta Pro Diver automatic men's watch, you can still afford to buy flippers and a pair of goggles. It features a shock-resistant, 21-jewel automatic movement that will stand up to the rigors of your undersea adventures, and it's water resistant to 660 feet. The watch case and stainless steel bracelet band are both plated with 23 karat yellow gold, and mix brushed and polished finishes. The navy blue dial includes large Tritnite luminous markers and hands, and a date window at 3 o'clock with a magnifier. 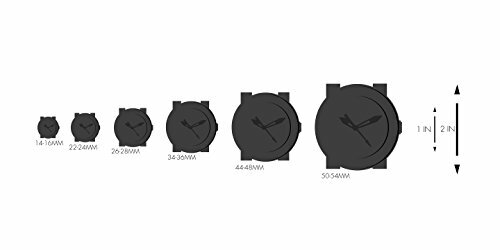 Other features include a unidirectional rotating bezel with elapsed time markings, fold-over clasp with safety, and a durable mineral crystal.